How it Works - A Quick Guide on How Xpango Works! You view adverts to get Xpango points and swap them for rewards! View adverts or invite friends to get Xpango Points. With enough Xpango Points collected you can swap them for rewards. We love giving our users free stuff and the most popular things that our other users love are: games, free gift cards, consoles, mice, free Spotify premium, keyboards, PC parts, mousemats, headsets, free iPhones, free xbox one games or free PSN codes. Welcome to the Xpango FAQ Area, everything you need to know can be found here; Information on Free Gifts, Offers, Referrals/Xpango Points, Delivery and the process of receiving your free gift. Xpango uses a unique Credit system to reward our customers with Free Mobile Phones, Gaming Consoles, Games, Skins, In-game items, Gift Cards. MP3 Players, HDTVs and Macs/PCs! Each Gift is received for Free in exchange for Credits which can be gained by Xpango members. When you register with Xpango and select your Free Gift, you will receive a ‘Referral ID’ which is used to gain Credits. Credits can easily be gained by either (or a combination of) participating in Xpango Offers or Referring Friends. Credit requirements for Gifts vary depending on the retail price of the Mobile Phone/Gaming Console/MP3 Player/HDTV. More expensive Gifts require more Credits than less expensive Gifts. Xpango genuinely provide the latest Mobile Phones, Gaming Consoles, MP3 Players & HDTVs – Worldwide and for Free! All gifts are provided in exchange for Xpango Points and there are many ways of gaining Xpango Points at no cost. The best way of gaining Credits for free is by; Completing Offers (Register for Free Offers such as Blockbuster, Intuit Websites and Gamehouse and get Xpango Points!) Referring Friends (Get Xpango Points for every friend you refer who completes an Offer or earns the required amount of points) Once you have gained your Xpango Points, you receive your Free Gift! When Do I Receive My Gift? Yes! simply gain the required amount of Xpango Points and your Gift will be dispatched to you (allowing for available stock). However, if you’ve been naughty and broken any of the Xpango rules then you won’t be receiving anything. We make the website fair for everyone involved and have to protect our members – some people like to break the rules and try cheat the system, which means we have to be extra cautious and have rules in place! Sometimes your order may be in a state of processing for several days. This is normal and nothing to worry about. Our system checks that there hasn’t been any fraudulent activity and then approves you to be sent your reward. Please check your emails for further information. There may be a delay in your order so if you can kindly be patient or send us a little note to ask us where it is, we will do our best to update you accordingly! Offerwalls are provided to Xpango via third-party advertising networks. They are solely responsible for the content they show you. 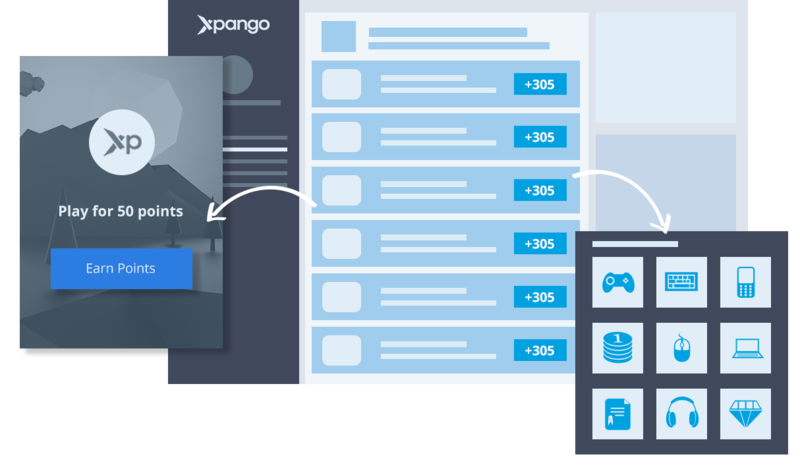 Xpango has limited control over what adverts you may be shown but in general you will see a range from App installs, surveys, trials, games, videos and more. When you complete an offer from any of the offerwalls your account will automatically be credited points. There are 4 ways to get points. Collect them daily on the site. Complete Offers from our offerwall partners. Invite friends. You can also enter our random giveaways. I Haven't Received any Points? There is sometimes a delay in receiving your points, usually they are credited within a few minutes but can often take hours and in rare cases they make take a few days or more. The reason for this is because it the advertiser or offerwall provider has checks on their system to make sure that the action you’ve performed is genuine and that your details match what we have on our system. For example if you signup to a trial with the name “John John” but our system tells the advertiser your name is “James Richards” then the advertiser will contact us to clarify this, which may take some time. Please make sure to complete all offers correctly according to the rules and instructions given by the advertiser. It is very important otherwise there will be delays and in some cases you may not get your points. If you still haven’t received your points it is likely that you broke the advertisers rules, either by using a VPN or Proxy or filling out fake information. You may have also completed this offer before on another website and therefore be ineligible to receive further rewards from it. If you believe there is an error please contact us or contact the support options within the offerwalls. I Haven't Received Points For Inviting Friends? When you invite your friends they must earn at least 1000 Xpango points before you get your free points bonus. Once your friend has earned this amount you will receive your bonus points. Can I get Points for Inviting Friends? The more friends you invite the more points you can get. We recommend sharing with all your social media and gaming friends. You can invite an unlimited number of people. Points Were Removed From My Account? If you’ve broken the rules or obtained points in an unfair manner then our system will usually automatically remove them from your balance. The offerwalls automatically do this and it is outside of our control. I Was Logged Out For Inactivity? Yes, our system will log you out if you have left the browser open for too long – this approximately 15-30 minutes depending on your recent browser activity. Please do not be alarmed, this is for your protection in case you were in a public space or left your computer logged in somewhere. We don’t want your points getting stolen! My Account is Suspended, Banned or Restricted Access? If this is the case it usually isn’t an accident on our part. Our system is designed for fair use from our users. We have very strict rules to protect the gift suppliers, advertisers and most importantly YOU from any wrong-doing or fraudulent activity. You agree to our terms & conditions when you register and in there are some very important rules that you must follow. If your account has been suspended, banned or restricted it means we have investigated you or are currently investigating behavior on your account. Breaching our T&C results in your account being moved into this state. It is very rare it was an accident on our part, but on the off-chance it was a system error we will be happy to reinstate your account. If you believe your account has been banned/restricted unfairly, we will be happy to look into your account further and act as a tribunal. For example if your rule breaking was only minor, we may be able to let you back onto the site if you were genuinely unsure it was against the rules. For example spamming your referral link on our Facebook page or lying about how many points a user would get from signing up to your link! Not Receiving Emails From Xpango? If you are not receiving any emails from us including registration links or password reset, please contact us immediately. There may be an issue on our end or there may be an issue with your email provider. However, support will be able to get to the bottom of any issue here and hopefully get you going again as soon as possible! Why Are You Asking Me To Turn Off Adblock? You are using a browser that contains a plugin/addon that disables advertising. We kindly ask that you disable this to use the website. Xpango cannot exist without adverts. We cannot give away free stuff without your interaction with adverts. The advertisers help you get points so we kindly ask you to turn off adblock to continue using Xpango. Disabling your adblock is very easy, please refer to your adblock provider on how to whitelist our domain. Once you’ve turned it off, simply reload Xpango. If you are still getting this message, please uninstall adblock or use a different browser! We added a little button on your menu to get a certain number of points as a little thank you for being our user. It’s not much but every little helps. The timer may vary but usually your points can be collected once every 2-12 hours. Please note, if this is your only way of collecting points, we may ask you to complete a few offers from our advertising partners or refer some friends. Changing your password is easy. On the menu please click “My Profile” – once you are there you can enter a new password and then click the “Update Password”. If you are having difficulty registering or logging in please try clearing your browser cookies and cache. If this does not work, please send us an email and we’ll do our best to get you in asap!